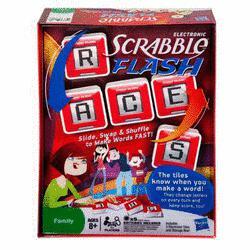 From the makers of the classic Scrabble game comes Scrabble Flash, a new electronic twist on a old favorite. Hasbro, owners of the Parker Brothers line of games including Scrabble, have developed a new electronic version of the classic boardgame just in time for the holidays. Instead of using a classic game board and those tiny tiles that kids love to lose, swallow or otherwise destroy, Scrabble Flash uses five red cubes, each of which can digitally display a letter. When tiles with viable letter combinations are touched together, they will beep, change color and the word will count. Scrabble Flash tiles: not so easy to eat. The game comes with a variety of play types to keep things interesting and keep minds engaged. The first, Flash, has players using the five letters they are given to spell as many words of any length as possible in 75 seconds. Each word grants points, and each five-letter word grants an 5 extra seconds. When the turn is over, the tiles will display the player's accumulated score and the next player will get five new letters. In Five Letter Flash, players are only allowed to make five letter words and get five new letters each time they make a word in the 75 second period. 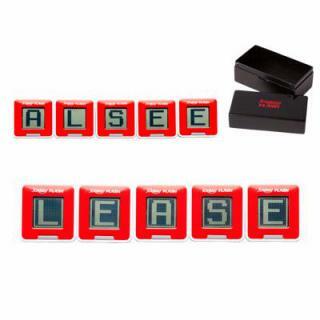 The last option, Pass Flash, has players making a five letter word and then passing the tiles on to a new player that gets five more letters. If the new player cannot spell a word soon enough, they are eliminated. The game comes with sturdy 2" red plastic tiles and requires 5 AA "button" batteries to run, which are included in the box. With the option to drop the game to four tiles for younger players and a more exciting playstyle than the standard Scrabble version, this toy has the potential to be a breakout hit this Christmas. Buy Scrabble Falsh for cheap at Amazon here.